The Cane Corso Italiano (also known as the ‘Italian Mastiff’ or ‘Cane Corso Mastiff’) is a war and hunting dog which originated in southern Italy. It likely descends from the Neapolitan mastiff and the Roman ‘Canis Pugnax’, a powerful war dog, though the Cane Corso Italiano is a lighter, more agile breed which was used by troops for hunting or as an auxiliary force (‘Corso’ comes from the Latin for ‘guardian’). The Cane Corso Italiano was also used in bull baiting, a gambling ‘sport’ wherein one or more dogs were matched up against a chained bull. The Cane Corso Italiano had declined to near extinction by the 1980’s, but since then an intentional effort to rescue the breed has increased the dog’s numbers substantially. It is most prominent in southern Italy. The Cane Corso Italiano has a shoulder height of 64-69 cm (24-27 in) for males and 58-61 cm (23-25 in) for females. Males weigh 45-50 kg (99-110 lbs) and females 40-45 kg (88-99 lbs). The Cane Corso Italiano is large, lean, and athletic in appearance, with ‘V’-shaped ears that flop forward, a long wide, muzzle, pronounced stop, and arched neck. The Cane Corso Italiano has short, dense, stiff hair in black, gray, fawn, or striped. It may have a black or grey muzzle or white markings on the chest and feet. The Cane Corso Italiano is a light shedder. The Cane Corso Italiano is a highly intelligent, loyal and protective dog that is very versatile and trainable. It is even tempered, alert, and confident, making an excellent guard or watchdog. Cane Corso Mastiffs are not aggressive, but will defend their owners fiercely when necessary. They are nearly unstoppable in a fight due to their unusually high pain tolerance. The Cane Corso Italiano is a highly intelligent, loyal and protective dog that is very versatile and trainable. It is even tempered, alert, and confident, making an excellent guard or watchdog. Cane Corso Mastiffs are not aggressive, but will defend their owners fiercely when necessary. They are nearly unstoppable in a fight due to their unusually high pain tolerance. The Cane Corso Mastiff is loyal, docile, and affectionate toward its family, especially children. The Cane Corso Italiano should be socialized when young to minimize aggression with strangers and other dogs, but even with training Cane Corso Italianos are usually on edge around those they don’t know. You can find Canecorso puppies priced from $250 USD to $8000 USD with one of our credible breeders. Browse through our breeder's listings and find your perfect puppy at the perfect price. The Cane Corso Mastiff is loyal, docile, and affectionate toward its family, especially children. The Cane Corso Italiano should be socialized when young to minimize aggression with strangers and other dogs, but even with training Cane Corso Italianos are usually on edge around those they don’t know. The Cane Corso Italiano does not require much grooming—only an occasional brushing to remove dead hairs is required. Cane Corso Mastiffs don’t mind living outdoors as long as sufficient socialization and shelter is provided. Like other large breeds, the Cane Corso Italiano is susceptible to hip dysplasia. It is also prone to bloat, so avoid overfeeding and space meals throughout the day. The Cane Corso Mastiff has a life span of 10-11 years. The Cane Corso Italiano is intelligent and easily trainable. It is versatile and can quickly learn a wide variety of tasks. Cane Corso Italianos are a fairly large animal with a mind of their own, so inexperienced owners should think twice about selecting this breed. The Cane Corso Italiano must be taught to submit to all family members. Obedience training is highly recommended for the Cane Corso Mastiff. The Cane Corso Italiano is athletic, requiring a substantial amount of daily exercise. It has high stamina, making it a great companion for long jogs or hikes. A fenced in yard is recommended; an apartment may not provide sufficient space. Canecorso Puppies for Sale - Shipped Worldwide! Finding the right Canecorso puppy can be dog gone hard work. PuppyFind® provides a convenient and efficient means of selecting and purchasing the perfect Canecorso puppy (or Canecorso puppies) from the comfort of your home, 24 hours a day, 7 days a week. Take advantage of our PuppySearch or leisurely browse our directory of hundreds of dog breeds, Canecorso dog breeders, Canecorso dogs for adoption, and Canecorso puppy for sale listings with photos and detailed descriptions. Some Canecorso puppies for sale may be shipped Worldwide and include crate and veterinarian checkup. 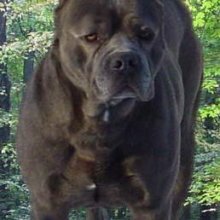 Many Canecorso dog breeders with puppies for sale also offer a health guarantee. With thousands of Canecorso puppies for sale and hundreds of Canecorso dog breeders, you're sure to find the perfect Canecorso puppy.